Choosing the correct brake pad starts with an honest assessment of the driver's typical driving conditions. For example, if the vehicle is driven 80 percent in highway and 20 percent sporty and zero percent on the track, then an Alcon "street" pad will likely offer the best combination of stopping performance, low dust and low noise. If the vehicle is frequently used for track days but also as a daily driver, it might be better served by the a mid-range racing pad - provided that an even transfer layer of pad material on the rotor is maintained by periodically re-bedding in the pads. Understanding your brake pad wear patters is important to diagnosing the general condition of your brake system. This guide can help you identify common issues. One pad has significantly less friction material than the other pad. This happens when the caliper piston is not returning to the rest position due to a worn seal, damage, or corrosion. Inspect caliper for residual pressure and guide pins or piston boot damage, respectively. 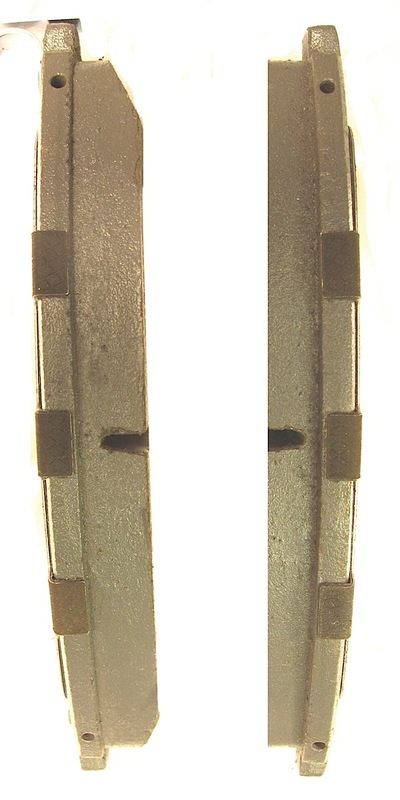 Wear like this is caused by the pad continuing to ride on the rotor after the caliper releases. Pads catching on the guide pins or the pistons not retracting (bad seals or damaged pistons) Service or replace the guide pins, seals, or the entire caliper, and replace the brake pads. This kind of wear is caused by improper pad installation, bad seals on one piston, or retention pin catching. The procedure for correcting this kind of wear is the same as correcting side to side pad wear. 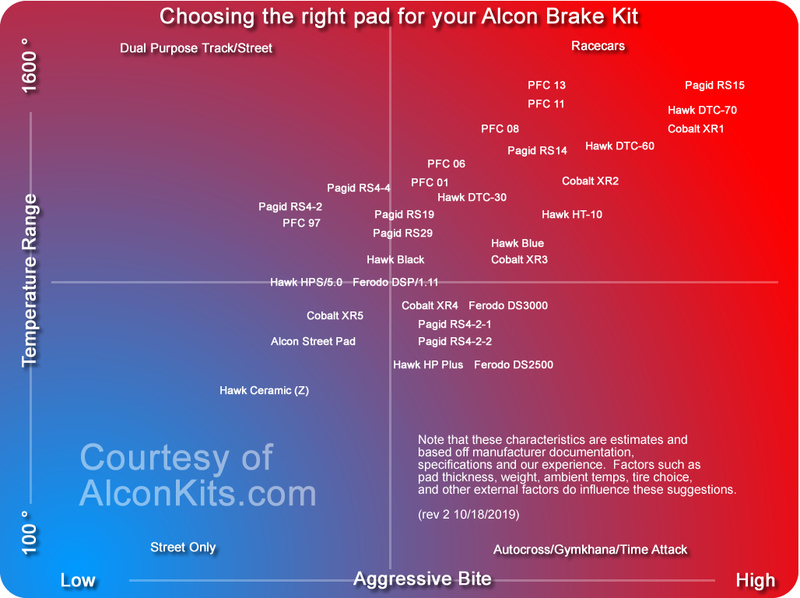 Pad Selection: Generally, there are street, performance and racing brake pads, and most quality pads have broader temperatureranges than pads made 10 years ago. However, no street pads are suitable for racing, and no racing pads are suitable for the street. Performance street pads are a compromise—they’re more effective at low temperatures than racing pads and they can operate at higher temperatures than street pads. Glazing the brake rotor with material from the brake pad. This happens because brake pads, like tires, are made with different amounts of hardness and stickiness depending on the intended purpose. When brake pads made for normal road use get very hot from high-speed driving and braking, or from riding on the brakes for a prolonged period of time, the grippy material can get too soft and basically "paint" the brake rotors. This means that the brake pads won't grip onto metal when the brakes are applied once again, causing decreased brake performance that is less smooth than before. Wearing down the surface of the rotor and making harder spots in the metal stay slightly raised off the surface. The reason that brakes don't normally wear down very much revolves around a fairly straightforward concept. 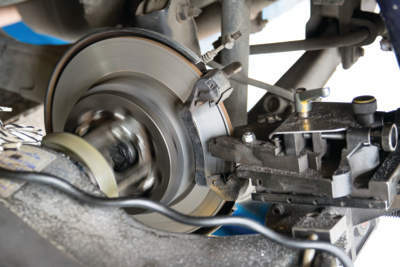 Since the metal of the rotor is harder than the brake pad applying friction to it, the pad wears down while the rotor remains largely unaffected. With excessive heat, the metal becomes soft enough for the pad to wear down the rotor surface. This means that slightly less dense spots in the metal wear down faster and make the harder spots stick out, causing warping. To prevent the brake rotors from becoming glazed over with brake pad material, be mindful of how much braking the vehicle is doing compared to what is done during normal operation. When going downhill for prolonged amounts of time, try to control the speed of the vehicle by shifting the transmission into a lower gear. For automatics, the only option is usually to shift into "3," while vehicles with a manual or other shiftable transmission can decide on the best gear to use based on the engine's revs. When the brakes are hot, never sit with the brake pedal hard down on one spot. Also, when the brake pads are first installed they should be properly broken in to ensure they don't leave too much material on the brake rotor. This usually involves getting the car up to road speed and then braking until it is traveling ten miles per hour slower. After this is done a few times, you can work your way up to braking to a complete stop. The first few full stops after that should be done with care. This allows the brake pad to perform better during hard braking further down the road. The steps that can be taken to prevent excess wear on the surface of the brake rotor are similar to the steps for avoiding glazed rotors. Be sure to avoid hard braking when the brake rotors have gotten hot from prolonged use. What do warped rotors feel like? If the brake rotors are glazed over, you may hear excessive squeaking when the brakes are applied or even smell burning rubber. If the braking suddenly becomes jittery and inconsistent, the brake rotors should be the first suspect. If the vehicle vibrates when coming to a stop, the brake rotor is likely warped. A rotor is the round piece of steel pictured below that your brake pads grab hold of when you hit the brakes. Depending on your hubcaps, you can usually see your rotors on the inside on the wheel. When a rotor comes out of the factory, it's smooth and even. When the brake pads make contact with both sides of the rotor evenly, smooth braking results. But what happens over time is that the rotors can become warped, meaning that they lose their smooth, even surface. When that happens, every time you go to hit your brakes, the brake pad encounters a surface that isn't entirely smooth, and the braking gets very bumpy. When you have warped rotors, they lose their sleek, smooth, and even surface for braking, which causes your car to shake. Sudden braking: As you're driving along, if you ever are forced to brake suddenly from a high speed, the friction can cause a level of heat on the rotor great enough to cause the rotor to warp. Constant braking: If you're ever driving down a long hill and are constantly having to keep your foot on the brake, the buildup in heat can also cause the rotor to become warped. Overuse of brake pads: Another thing I've experienced that has caused rotor damage has been excessive use of brake pads, meaning that the brake pads weren't changed early enough and partial metal on metal friction was allowed to happen. I've replaced rotors before that have had such deep grooves that you could literally put a marble in them and spin it all around the rotor. You don't want that to happen to your vehicle. When your rotors get warped and your car shakes when you hit the brakes, you have a couple of options. If you change your own brakes, it will be a lot less expensive to fix the problem than if you take your car to the shop for brake jobs. If you've been experiencing some shaking when you hit the brakes and you're due for a brake change, then that's the perfect time to deal with your warped rotors. If the rotors are fairly new then you may not need to replace them. You can take them off and drive them down to your local auto parts store and have them turned on a special machine that grinds down the outer warped layer of the metal to make the surface smooth and even again. But there are two things that you need to be warned of when considering this process. If your rotor is too thin the auto parts store won't grind them down for you and you'll have to buy new ones. This isn't really all that much of a problem since new rotors are generally only about $40 a piece. Make sure you call ahead to schedule a rotor turning appointment. Sometimes when auto parts stores are swamped, it may take a while to service your rotors and you'll end up sitting there for a long time. The process shouldn't take more than 30 minutes or so per rotor, but if the shop is busy, it's just best to call ahead and make sure they can do it quickly for you. Each auto parts store will probably have a different cost for turning your rotors, but it shouldn't be more than $25 or so. So all in all, changing your brakes yourself and having your rotors serviced should cost you less than $100, which is pretty nice. If you don't service your brakes yourself but take them into the mechanic, tell your mechanic that your rotors are warped and that you want him to turn them for you. Ask him how much it costs for the process and hold him to it. Another thing you can do is to go to the auto parts store before you go to the mechanic and buy a set of rotors from the store and then ask the mechanic to replace your rotors when he does the brake job. It should only be a matter of loosening a couple bolts, so don't let him charge you an arm and a leg for the labour. • Wheel bearings. Unitised bearings, in particular, are preloaded and have zero play, which means there is no wiggle room for runout. Any high and low spots will scrape the brake pads with every revolution of the rotor — braking and non-braking. Cold brake roughness manifests in a similar feel of pedal pulsation or steering wheel vibration, and in severe cases, there will be speed-related surges in deceleration felt during normal driving and light braking. This phenomenon is caused by lateral run-out that exists when the rotors are initially mounted on the car. Over time, this gradually turns into disc thickness variation due to inconsistencies in the lining only touching the higher spots of the rotor during off-brake driving. That mentality is troublesome when it comes to servicing brakes — saying a rotor is warped easily puts the blame on an ineffective part that needs to be replaced when that isn’t the case. Understanding that a warped rotor is a myth is to understand that there are other causes for the braking condition and additional work is needed to do the job right. This may seem like a matter of semantics, but mischaracterising the root problems of pulsation just perpetuates the myth. Brakes are an important part of any vehicle, car or motorcycle, and it is essential to have every component of the brakes in top working order to ensure your safety and that of your passengers. Sometimes, brake rotors can warp, causing a throbbing or pulsing sensation when you apply the car brakes and while coming to a stop. Brake rotors warp as a result of the rotor becoming distorted; however, rotor warping can also refer to uneven wear patterns on the rotors that produce the same throb or pulse. To prevent rotors from warping, there are certain things to consider. If your brake rotors are already warped, you need to replace them with new ones. It is best to use a brake rotor of high-quality metal and weight because these rotors remove heat more effectively than others. The heavier metal rotor reduces the distortion from warping by stopping heat damage and allows the rotor to operate using cooler temperatures. This also prolongs the life of your brake rotor and reduces the wear and tear on your brake pads. If your brake rotors have been warped for a long period, you might need to consider installing new brake pads. 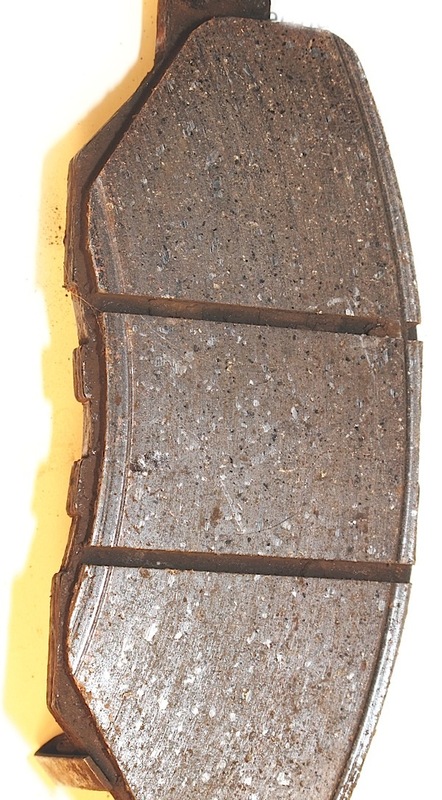 Over time, the warped rotors cause the brake pads to wear unevenly and quicker. Be sure the new brake pads are appropriate for your vehicle; for example, ceramic pads built for high temperatures are made for racing vehicles that use extreme braking conditions. If you use these on a normal vehicle, you will cause premature wear of the rotor and a poor performance at normal speeds. Once you have installed new brake rotors and pads, you must break them in properly. Brake pads clean the rotor and apply the right amount of friction to stop the vehicle. Not breaking in the rotors and pads could reduce the ability of the pad to clean the rotor sufficiently. This can cause uneven wear or warping. Each vehicle has its own regulations for break-in procedures, although general guidelines are helpful. When you are ready to break in your new rotors and pads, do so in an empty parking lot or vacant street. Always be safe. Start accelerating again to 50 miles per hour and slam on the brakes again just until the ABS has been engaged (approximately 10 miles per hour). Again, do not come to a complete stop. Repeat the above two steps for a total of four times. So far, you should not have completely stopped yet. Accelerate to 65 miles per hour, and then take your foot off the gas and coast to 15 miles per hour. Once at 15 miles per hour, brake slowly until you come to a complete stop. Park the vehicle and let the car cool off for 20 minutes. When applying this procedure, there should not be a lot of gaps between the hard stops, meaning you should accelerate quickly. Do not come to a full stop during a hard stop, as this will imprint the pad on the rotor and cause vibration. It is normal to see smoke, smell odours, and hear squeaking sounds during this process. Once the above process is complete, you need to drive at least 400 miles before the pads are fully embedded into the rotors and giving you optimum performance. Remember, it is important to read the manual for the brake pads and rotors, since the specific break-in procedure may be different; however, if no procedure is provided, use the one above. After the break-in procedure, it is important to prevent warping from happening again, or you might be continuously purchasing new rotors and pads before their time. First, try to avoid driving through puddles of water. Generally, puddles are cool water, and if your brakes are heated (and they do heat quickly), the cool water will cool them off too quickly and could distort the metal. Anytime the lug nuts on the wheels must be removed, they should be evenly tightened again. Using either the cross pattern or the star pattern, tighten the lugs so there is no uneven clamping between the wheel, rotor, and hub. You should also clean the brakes and rotors with brake cleaner at least once a month. This will remove particles that could be embedded into the rotor surface and cause warping. There are actually quite a few rotor types, and each of these is meant to do something different. First, you have the normal rotors that came with the vehicle. These are simple rotors cast in iron and come in a variety of diameters and thicknesses. Cross-drilled rotors are another type and have holes drilled all around them. 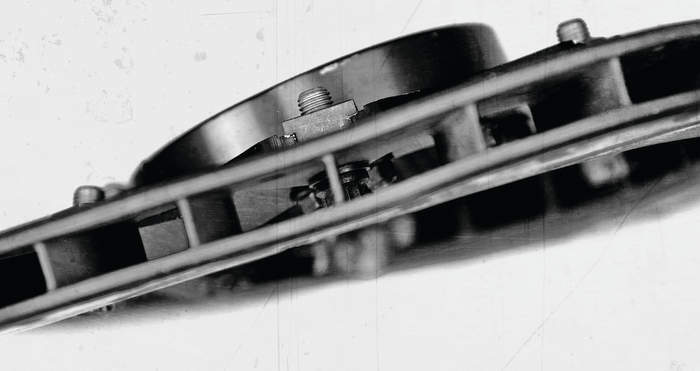 These holes are spread out over the surface of the rotor and help the rotor cool down during hard braking situations. They are used for high-performance vehicles (race cars) because of the constant stop-and-go of these cars. 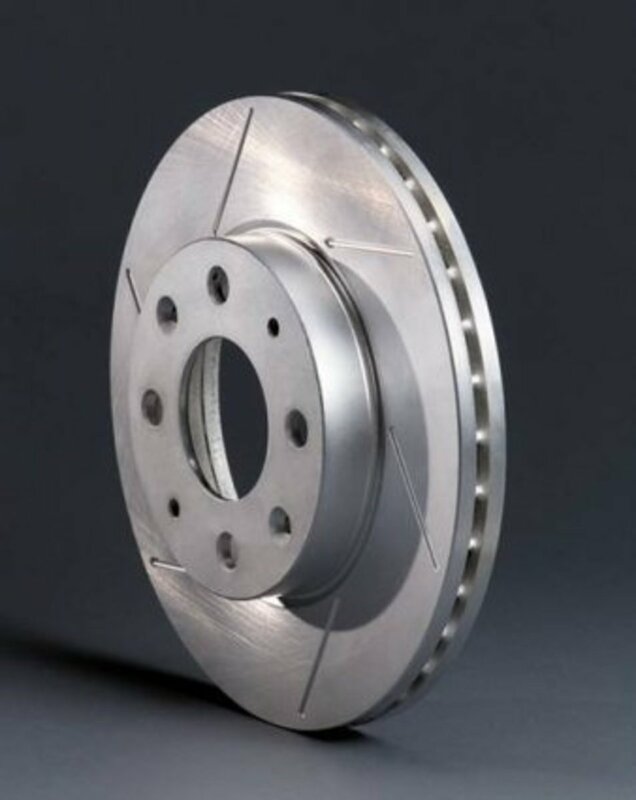 These rotors are also being used in everyday vehicles because it makes an improvement on their braking; however, many vehicles cannot handle these cross-drilled rotors, and it can cause the rotor to wear more quickly. Be certain your vehicle can use these rotors before purchasing them. Another type includes the vented rotor. These have small "veins" or vents inside the rotor that also help keep the rotor cool during the braking process. 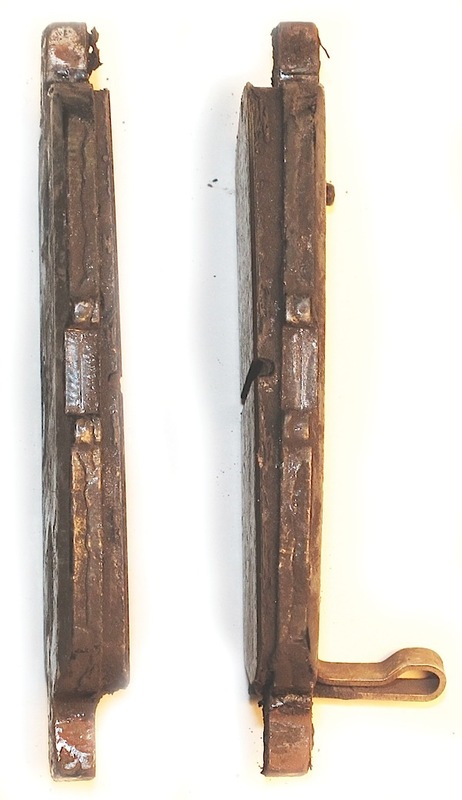 These vents are created during the casting process to uphold the integrity of the rotor. Slotted rotors are also used to cool brakes and are generally placed on an angle. You may also find rotors that have all three of these types in one: cross drilling, slots, and vents. This allows the maximum cooling ability but is not always meant for use on regular vehicles. If you have warped rotors, whether on a car or motorcycle, you will need to replace the brake pads and rotors before doing anything else. Utilise the DBC search bar to find brake rotors, or any other part, by typing in specific keywords, such as "brake rotors." You will probably see hundreds of thousands of options available to you, but it is easy to narrow your search. The results will include a grey box for you to select the information for your particular vehicle including year, make, model, trim, and engine. This will allow you to look at only those that will match your specific vehicle, which can be a big time saver. You must first select a year before selecting anything else. In some cases, you can find sets, which include the brake pads and rotors for either the front or back (or both). If all the rotors need replaced, DBC is a great option. The best scenario is to prevent brake rotor warping, but if you already have this problem, it is important to take care of it as soon as possible by replacing the rotors and brake pads. Consider different types of rotors to give you the best cooling brake system available for your vehicle to ensure that brakes cool properly and to guarantee there is no more warping. After replacement, you will need to break in the rotors and pads according to the manual or the guidelines provided. To keep the rotors in the best working order, be sure to lubricate the rotors, pads, and wheel hubs properly as needed, and refrain from driving into puddles when your rotors are overheated due to excessive braking. No matter what strange noise your car is making, it almost always turns into the ca-ching of your mechanic's cash register gobbling up your cash. Because car repairs are expensive, it's tempting to let them slide. But putting off or skipping certain repairs can be a costly and even dangerous game. Here are five car repairs you might be tempted to skip in order to save a few bucks. But we'll show you how making that call could cost you a lot more in the long run. Most figures provided are based on service estimates from RepairPal, an online provider of independent and unbiased repair estimates, and are for the Washington, DC area. Be sure to visit their site to see how much you can expect to pay at your local mechanic shop. Common sense dictates that you shouldn’t neglect your car's brakes. Still, when it comes time to replace brake pads, it's easy to look the other way. After all, brake pads tend to wear gradually, so it may take some time before you notice changes in braking performance. Delaying the fix, however, can prove costly and dangerous. Rotors are especially costly to repair or replace. 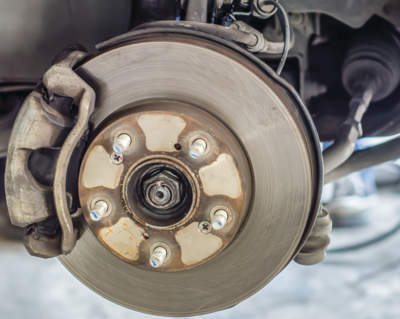 As they rub against worn brake pads, rotors become warped, which makes it tougher to stop the car (if you feel your car shudder as you brake, you probably have warped rotors). Fixing them requires that they be turned or smoothed out by a mechanic -- if, of course, they can be salvaged at all. How much can you save by staying on top of your brake pads? Lots. According to RepairPal, replacing the front brake pads on a 2010 Honda Civic can cost anywhere from $144 to $207. If, however, the front rotors need to be resurfaced, the price increases to $208 to $289. Still, that’s cheaper than replacing a pair of front brake pads and rotors – which costs a whopping $372 to $485. Not changing your car’s motor oil on a regular schedule can be detrimental to its health. Fortunately, an oil change is easy enough to do yourself. It’s also cheap enough to have a pro do it for you. While most service stations recommend that your car has its oil changed every three months or 3,000 miles, many new cars can travel up to twice that distance without needing one. To find out how long your car can go between oil changes, check your owner's manual. After you've figured out the recommended oil change interval for your car, stick to it. RepairPalreports that an oil and filter change on a 2010 Ford Fusion costs between $27 and $45. The price of a new engine? That’ll run you four figures. Changing an air filter is relatively inexpensive. However, ignoring a clogged one can cost you big bucks at the pump and the mechanic shop. According to a recent study by Oak Ridge National Laboratory, a new air filter can increase the fuel economy of a carbureted engine by two to 14 percent, depending on how clogged the old filter was. While there’s no fuel-economy gain for fuel-injected engines, a new air filter does enhance vehicle performance -- providing six to 11 percent faster acceleration time. So what will it cost? RepairPal says that having a pro install a new air filter on a 2010 Chevrolet Cobalt will run $47 to $69. Or you can buy one at your local auto supply store for under $40 and install it yourself -- it’s really easy to do. Either expense is pocket change in comparison to the long-term cost of decreased fuel economy. It’s also a bargain compared to the cost of what may happen if you continue to drive with a dirty air filter. For instance, a dirty air filter can prevent sufficient air from reaching your car’s engine, fouling the spark plugs. RepairPal reports that replacing a set of those on a Cobolt will cost $105 to $138. To keep your engine running at optimal performance, impurities need to be kept out. While the air filter prevents airborne matter from polluting the engine’s components, the fuel filter does the same for whatever sediment may be in your gasoline. Like the air filter, the fuel filter needs to be replaced from time to time in order to prevent a much costlier fix. On older cars, a fuel filter is relatively easy to replace because it's easy for mechanics or car owners themselves to get to. On newer cars, it's a more complex job. More complexity means more money, which makes this repair tempting to skip -- despite the fact that it can lead to dirty fuel injectors, which could make your car stall or refuse to start altogether. Don't skip it. The difference in price between replacing your fuel filter and fuel injectors is significant. According to RepairPal, replacing a single fuel injector on a 2010 Nissan Altima can run as high as $437. Replacing a fuel filter, on the other hand, starts as low as $88. Here's one car repair on our list that is really easy to ignore. After all, a burned-out headlight won't eventually lead to engine failure or to your transmission falling out. It could, however, lead to a costly fine or accident. Indeed, failure to keep your headlights working can be an expensive proposition. First, if a police officer sees you with a burned bulb, you're going to get a ticket. That fine could make paying a few dollars for a new bulb seems like chump change. Second, broken lights increase your risk of being in a crash. Even if you don’t harm yourself or anyone else, you’ll still have to deal with the headache of getting your car fixed. Who needs that? Replacing a burned bulb is easy and inexpensive. You can order one online for as low as five dollars or, if you’re not handy, have a pro do it for you. RepairPal estimates that the fix will cost between $56 and $77 on a 2010 Volvo XC70. Is it Safe to Drive With Warped Rotors? 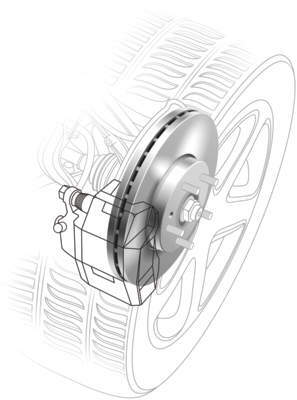 The rotors are part of the disc brakes that allow your vehicle to stop once the vehicle is in motion. If the rotors are warped, your vehicle may not be able to stop properly in an emergency situation. This can be dangerous if you need to stop to avoid a car accident, pedestrian, or another driving situation. As soon as you start to realise the brakes are not working like they should, you should contact a mechanic and have them check for warped rotors. Rotors wear down over time, which can decrease their reliability. The brake system, such as rotors, calipers, and pads, should be inspected on a regular basis because they do wear down. One danger of warped rotors is the increased stopping time. Even if the surface is smooth, the vehicle will still take longer to stop. If the warped rotor is on the drive axle of the car, the stopping time of your vehicle will be more noticeable. A warped rotor can cause the brakes to temporarily fail. The warped rotor causes the brake pads to wiggle back and forth, which causes the brake fluid to foam up so the braking system does not get the proper amount of hydraulic pressure. If you temporarily lose control of your brakes, this can cause you to hit vehicles around you. While driving, if you feel vibrations in your brake pedals, this may be a sign that you have a warped rotor. Sometimes the vibration can be felt with only a small amount of brake pressure, where other times it will take more pressure to feel the vibrations. Either way, once you start feeling this, contact a mechanic so they can fix the problem. Brake noise is another sign your rotors may be warped. This is because the rotors will be contacting your brake pads unevenly. The noise can sound like a thumping or a pitched hum. If you suspect you have warped rotors or your brakes are failing, it is important that you avoid driving your vehicle and contact a mechanic right away. Driving with warped rotors potentially will result in a brake system failure, which can cause injury to yourself and those around you. To keep yourself and others around you safe, have your warped rotor problem repaired before you get back on the road.